The burgee of the (pre-Castro era) Automovil y Aero Club de Cuba. The CTC (Central de Trabajadores de Cuba, Cuba Workers Central) gathers several labor unions regarding each economic sector, such as the Sindicato Nacional de Trabajadores de las Comunicaciones, la Informática y la Electrónica (National Union of Communications, Information and Electronics Workers), the SNTA (Sindicato Nacional de Trabajadores Azucareros, (National Union of Sugar Cane Workers) or the SNTC (Sindicato Nacional de Trabajadores de las Ciencias, National Union of Scientists) (official website), 19 in total (as of 2006, according to this page). It was established in 1961 as CNOC (Confederación Nacional Obrera de Cuba, National Labor Confederation of Cuba), after the Cuban Revolution, but it has its roots as early as 1933." The CTC awards the "Vanguardia Nacional" (National Vanguard) flag meeting several criteria, and it applies to economy sectors such as a small productive unit, called UBPC (Unidad Básica de Producción Cooperativa, Cooperative Basic Production Unit) as well as government oriented services, such as meteorological associations and even collective productive entrepreneur oriented associations, called UEB (Unidad Empresarial Base, Basic Entrepreneur Unit). (Bear in mind that Cuba does not have a market economy, there is no private property, so ther are no companies as the basic productive unit, but rather communal associations called cooperatives). Once the flag is awarded, to an individual or to a "colectivo" (collective) (an informal term to denote an association), the person and or organization that receives the award acquires the condition of "Vanguardia", since it is an award that grants a status and is given annually. Hence, it is not ratified nor it is lost. 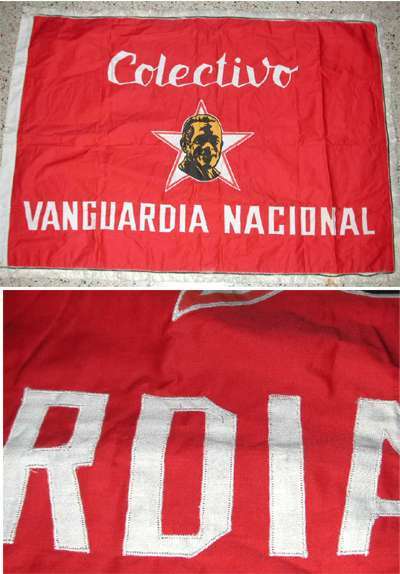 The flag is a red horizontal flag with the word "Colectivo" (Collective) on top, in the middle featuring a logo which is the bust of Jesús Menendez a sugar cane labor union member, and on the bottom it reads "Vanguardia Nacional" (National Vanguard) as seen here. The "Vanguardia Nacional" flag had already been reported barely explained and labelled as "Other Communist Flags". The CTC flag consists of the logo on a red horizontal flag, as seen here. The CTC flag itself is also used as an award intended for the same scope of organizations as the "Vanguardia Nacional" flag award. red horizontal flag. The Congress is held every five years. The other flags were national flags of South American and European countries.